Our annual Adopt-A-Pet Event is tomorrow, Saturday, October 13th. We will be in front of Paws 'N Claws at Central Park Plaza from 10am-3pm. 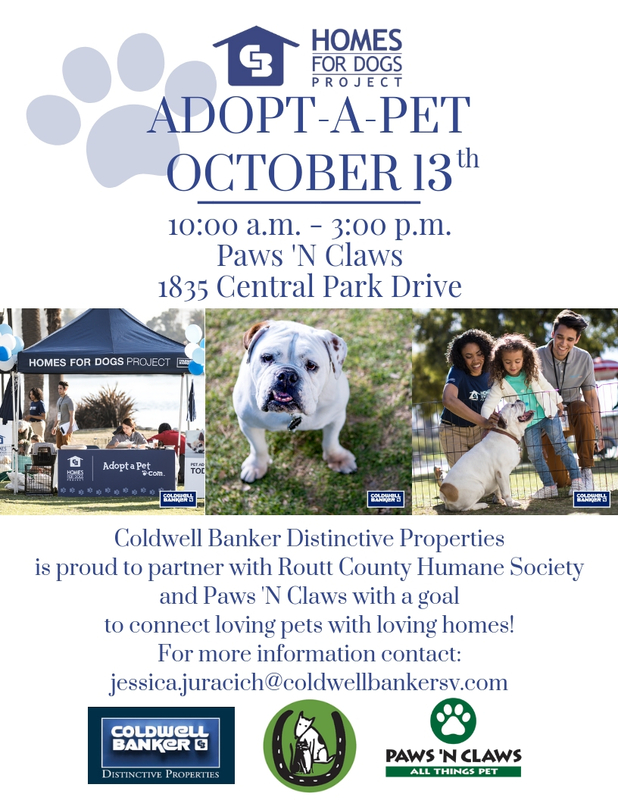 This is Coldwell Bankers fourth annual Home for Dogs Pet Adoption Event. This is part of Coldwell Banker’s “Home for Dogs Project,’ a national campaign hosted by Adopt-A-Pet.com aiming to find homes for 25,000 dogs in 2018. At the event you will be able to see some of the adoptable dogs and cats. We will be selling ‘hot dawgs to house dogs,’ as well as other snacks and beverages, and even an ‘Ask a Vet’ booth for people to ask any questions about animal care that they have. If you’re not at a point in your life where you can adopt a pet, we are still accepting donations in the form of money, gift certificates to local shops, or pet supplies. The RCHS is also in need of: bleach, kitty litter, paper towels, 13 gallon trash bags, and kink free hoses. We are also having a drawing with several prizes including doggy gift baskets, an acupuncture session for your pet, a dog spa day, gift certificates to local retailers, and much more!! Tickets are available now through Saturday at 3:00 pm. They can be purchased at the Routt County Humane Society, Coldwell Banker Distinctive Properties, Paws ‘Claws, and at the Pet-Adoption-Event in front of Paws ‘n Claws tomorrow. Tickets are $3 each or 2 for $5. The winner will be announced Monday, October 15th via Instagram, Facebook, and on the coldwellbankersteamboat.com blog and website. All proceeds go directly to the Routt County Humane Society.